The news that Qantas has been devalued by two rating agencies to “junk status” filled many of us with dismay. In 2020, Qantas should be celebrating its 100th anniversary. Only two airlines: KLM and Aviannca are older. Qantas has survived the Great Depression, World War Two, 1970s hyperinflation and oil crisis, the Asian Financial Crisis, the bombing of the World Trade Centre, SARS and the the global financial crisis. It has outlived other Aussie competitors: Ansett (1935 to 2002), Australian National Airways (1936 to 1957), Compass (1990 to 1993) and East-West (1947 to 1993). Today, its Australian domestic market share is being attacked by a new and aggressive competitor Virgin Australia. The international network has been trimmed. The long flown kangaroo route has been axed and a deal with Emirates has handed customers over to the bigger rival. The Jetstar brand is costing it money in Vietnam, Japan, Hong Kong and Singapore. Jobs have been cut and continue to be cut. This once mighty kangaroo has seen a fall in its ratings by passengers. For example, Skytrax places them at tenth place. The fleet is getting old. Shares have continued to fall in value. While Qantas is still solvent, it is bleeding cash. Or become an Australian domestic carrier only with some regional routes? The decision to link with Emirates has shown up the service gap that exists between Qantas and the world’s best carrier: Emirates. The Emirates product is largely superior and anecdotally, many business customers are choosing Emirates over Qantas to Europe. If Qantas wants to be seen as an equal partner in their key alliance, then their service offerings need to be improved. This means food, amenity kits and even re considering the abandoned wifi (Qantas ditches wifi). As much as I have criticised the partnership with Emirates, other partnerships need to be aggressively built up to get passengers onto the Qantas network. This would be an arrangement similar to Virgin Australia’s deals with Air New Zealand, Etihad and Delta. Virgin fly to only a handful of international destinations but their partners allow them to extend their global reach. 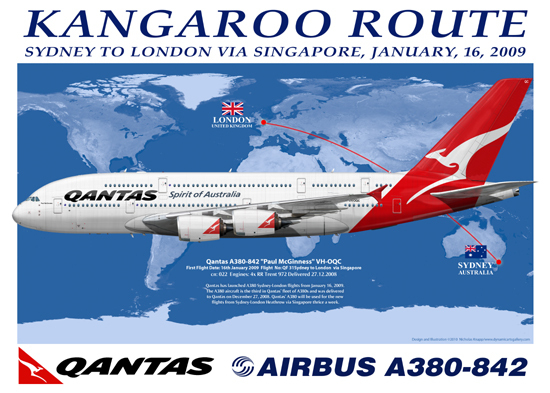 In Qantas case, there is their existing One World network including Cathay Pacific and LAN. Using these “virtual” networks to fly visitors from all over the globe to Australia and Australians to their preferred destinations is vital. Qantas has reduced their international network drastically. Some of it has resulted in Australians flying low cost subsidiary Jetstar, some have switched to Emirates and some have flown other carriers. I was in Vietnam recently and most of the tourists, I encountered were Australian. Had they flown with Qantas? No! Qantas does not fly to Vietnam. As for China. Australia’s biggest trading partner? One solitary flight from Sydney to Shanghai. Why not Melbourne-Hanoi-Paris? Sydney Beijing -Frankfurt? Melbourne-Shanghai-London. Wherever was profitable. This could mean engaging Vietnamese and Chinese staff and yes their wage costs would be lower. Jetstar now has a fleet size that is 2/3 the size of Qantas. Its Australian domestic growth is significantly impacting on mainline Qantas. The Asian arm has not made the money that previous CEO Geoff Dixon suggested that it would. Growth in the Asian market must not cost Qantas its existence. The Qantas workforce has been effectively disengaged for many years. They have been complaining for sometime at their feeling of a lack of value. Jobs are being cut every few months as the airline cycles down. The grounding of the entire fleet in 2012, to win an industrial relations war has damaged both consumer support for the brand and staff morale. Qantas has some old aircraft in the form of its fuel inefficient 747s and 767s. They keep refurbishing them while ignoring the obvious issue: they cost too much to fly. A 330, 380, 737 and 787 fleet needs to be reverted to as soon as possible. Frequent flyer pages are filled with the lack of connection long term flyers have felt with their preferred carrier for some time. Responding to frequent flyer complaints and reaching out to them is imperative to restore the carrier’s credibility. Korean airlines makes a huge chunk of revenue from Duty Free. Air Asia sell airline souvenirs and memorabilia. Most low cost carriers make it easy to buy baggage in advance rather than just punishing excess luggage at check in. Premium Economy has proved popular at Qantas. Taking all of these options to earn additional ancillary revenue and expanding them has the potential to generate Qantas more revenue from customers who have already paid for a ticket. Add expanded travel insurance, hotel and hire car options and this revenue could touch hundreds of millions. In 2010, Japan Air Lines was declared bankrupt. Today, it flies successfully. The work taken to get there was drastic. Now its the turn of Qantas. What happens in the next six months will set the tone for what happens in 2020 when Qantas should turn 100. This post, like my other posts is written as a private individual and has no connection to my professional work. Am flying them from US to Australia and back in July. Should i be worried? Virgin Australia aren’t just the ‘hip’ airline in Australia, they are now the ‘better’ airline. Qantas still have the arrogant attitude that people are only choosing VA because they can’t afford/can’t book etc QF. But VA has come a long way under Borghetti (ironically, an ex-QF exec and the man QF passed over for CEO in place of Alan Joyce, who has pretty much destroyed QF – VA is actually successfully using many of the strategies Borghetti had originally envisaged for QF) and has made strides in customer service while QF has languished. The fact that Qantas dropped Australia’s 6th largest city (the Gold Coast, which has a pop of 750,00, three universities and is the centre of Australia’s IT and health industry business sectors, not just a tourist beach for leisure routes) to replace all services with much-loathed Jetstar is an example of the kind of arrogance QF have treated passengers. Many other routes have also been unpopulalry Jetstar-ised, meaning people who don’t want a horrible flying experience go to VA. QF have now re-entered the GC market but it’s now too late, the switch for many to VA has been made. The QFF point is interesting, the program has been devalued so much it often costs as much in cash ‘fuel surcharges’ (to a level that would even make BA blush) as it would to book a cash ticket in the first place – in a addition to a poor points price to begin with. The only thing that will save Qantas is getting rid of the orange cancer (Jetstar – which is universally loathed by Australians, especially when QF bookings are put on it) and getting rid of the board. How Alan Joyce still has a job is beyond me, he has almost single-handedly destroyed the airline. They need a good product to save to make it worth saving. Disclosure: I was once QFF Gold (and for at least one more month, still am), but have made the move, am now VA Platinum and couldn’t be happier. Nothing to fear-their service beats United and Delta on the sector. I cannot see them canceling that sector by July if they ever scrap it, Enjoy your flight and visit to Australia.